iRc’s sales team consists of seasoned professionals who help technology solution providers reach their objectives and metrics. Our team members typically hold a bachelor’s or higher degree and come from a wide range of backgrounds including marketing, sales, lead generation and internet technology. 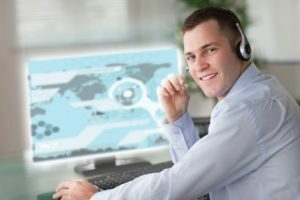 Our telesales professionals enjoy the benefits of being able to work virtually from anywhere, supported by highly advanced virtual call center technology and an experienced team of project leaders whose job it is to help you succeed along with our clients. If you are a highly motivated self-starter seeking a flexible schedule in a virtual environment, consider applying for a professional telesales position with iRc. Please note that this is a business-to-business telemarketing position using our cloud based telesales system designed for virtual agents. The position will require cold-calling our targeted lists using your own phone line, a WINDOWS-based computer, and high-speed internet access. You must be able to commit at least two hours per day for the first two week training period. After that, the days and number of hours that you work are flexible although you must commit to at least a minimum of four hours per day during the 5 day working week. Our clients are A-list firms who are leaders in the IT industry. The candidate for this project will be cold-calling IT Managers and other mid-level executives in order to generate surveys regarding their technology plans for the next 12 months. You should have some basic knowledge of IT concepts, but will be trained on the specific technologies you will be presenting. All calling lists, scripts, and marketing materials will be provide to help ensure your success in taking these surveys. Training is provided and you will be paid during the initial training period. If you are a self-starter who is motivated enough to make calls from your home that is located within the United States, without direct supervision and you have experience selling into or working in the IT industry, please apply by emailing your resume or filling out the form on the left, no phone calls will be answered.